Summer reading time is coming, and my fellow Girl Scout leaders and I wanted to give our fourth grade troop a bit of a spark. We decided to dedicate our monthly meeting this week to holding a Book Swap! We asked the girls to each bring in at least one book to donate to the Swap. We definitely encouraged them to bring more, and several of them did. The girls are in fourth grade, so we suggested that the books be about a grade 3-6 reading level. We did not want books that were too young or too old for them. At the beginning of the meeting, we asked the girls to keep one of the books to talk about, and lay the extra books on the table. With 15 girls, we had two huge tables packed with a layer of books. Most were fiction, but there were a few nonfiction mixed in. 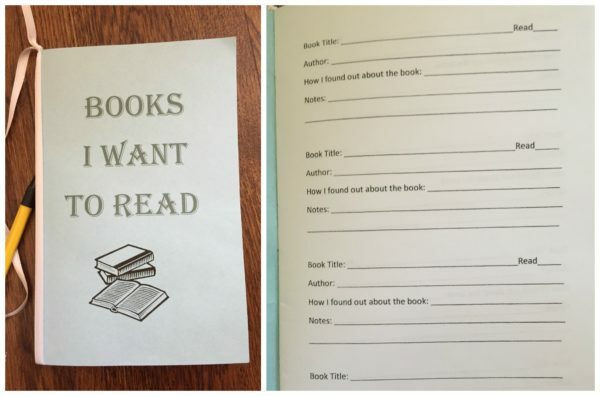 I made a booklet so the girls could keep track of the books they want to read, and also those they have read. One side of the booklet was "Books I Want to Read." The inside of that half of the book had pages for brief notes about the book: Title, Author, How I found out about the book, and Notes. There was also a section on the top line where the girls could write the date once they have read it. The flip side of the booklet was titled "Books I Have Read." Here, the girls can write a few notes after they have read a book: Title, Author, How I found out about the book, Who might like the book, and Notes, along with place to mark the date they completed it. I added the "Who might like the book" line to this side because I wanted the girls to start thinking deeper about books, what they liked about the books, and thinking about their friends' interests so they can suggest books to each other. Kids are so much more likely to be excited about reading a book if their friend recommends it! Last year, Becca went to an event at Short Stories with one of her musical theater buddies. It was an author meet-and-greet with two Broadway actors who wrote a middle-grades series called "Jack and Louisa." Over the weeks she was reading the book at home, she said she and her friend would talk about the book at school (yeahh!!! ), and then she said she thought another of her musical theater friends would like the book. She decided that she wanted to share the book with this other friend (but she wanted it back, so she put her return address label on the front cover as a reminder). I love that the girls are sharing books and thinking about who might also like certain books! We then asked the girls to stand up one at a time and introduce one of the books they brought to donate to the swap. They told about the title and author (which I wrote down on a poster so girls who were interested in reading it could write it in their "Books I Want to Read" side). They also gave a brief summary (sometimes reading the back cover) and a quick answer to why they liked the book. They then placed the book on the swap table. After all the girls talked about their book, we drew numbers so each girl could select a book. Some knew right away which book they wanted, and others perused the table for minutes before selecting one. It was very sweet to see some girls so excited that the book they wanted was available to take when their number was picked! We then reversed the order (so the girl who was called #15 goes right away again, through to #1 who goes last), and each girl selected another book. Then we opened it up so they could take any remaining books they wanted. Some girls went home with two books, and others went home with 8! It was sweet to see them talking about the books they selected, and who picked the book they brought. One girl's comment said it all: "I don't like to read, but I'm excited to read this book!" Hooray! We sparked an interest in reading, in thinking about books, and in talking about books with friends! Happy summer reading!